We had lots of action this past weekend and we have a lot of notes on it, so let’s just get right through these recaps. It wasn’t all great. Let’s just rip it off like a band-aid. 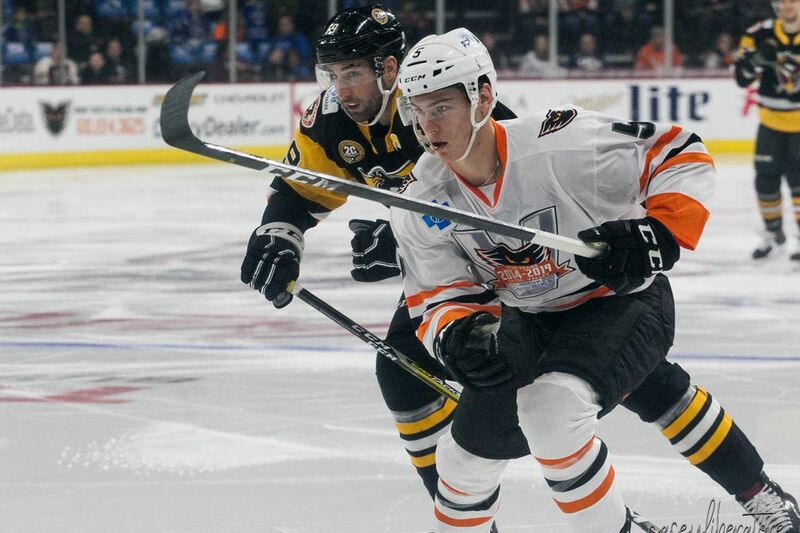 The Phantoms kicked off their three-in-three road trip on Friday in Providence where they tried to hang, but found themselves chasing through most of the game. They got goals from Chris Conner and Mikhail Vorobyev, which were pretty nice, but they just couldn’t put together the push needed to come back from that onslaught of scoring in the first period make the late-game comeback and push things to overtime. It was the same story on Saturday in Hartford, and then it was a little bit worse. We got a goal from Nicolas Aube-Kubel that we’re going to be talking about in a bit, and that was just about all the good stuff we have to report from this one. The Phantoms were chasing in this one too, were able to create some chances, but were also bleeding dangerous chances against (allowing 10 in total, of the Wolf Pack’s 25 shots). So when they couldn’t quite claw their way out of the hole that ended up being 4-1, well, it made sense. The good news is that they came out on Sunday in Springfield and looked much better. They came out with some pace, buckled down, and got to work. The Phantoms got goals from Greg Carey, Phil Myers, and Connor Bunnaman, but it was very much a “you get one, I get one” even kind of game, so the 3-3 tied held at the end of regulation and off to overtime we went! The Phantoms survived the initial push by the Thunderbirds, and then it was a pretty spectacular play by Mark Friedman that won it for them, and stopped the losing skid. Not too much in the way of news this week, just a couple of quick notes. Branden Komm’s start on Saturday marked his first in the AHL (so that’s a fun milestone!). Mike Huntebrinker’s also been loaned to Reading. We don’t know if that’s because someone’s close to being ready to return for the Phantoms (as this leaves them with just 12 healthy forwards) or if it’s just to get him in for a game in Reading, which is close enough to make this move easy. But we’ll find out tonight, we suppose! We faced a real moral dilemma last week when it came to picking our third star of the week, and it unfortunately ended in us leaving him off our final list, after much inner turmoil and trepidation. But the good news is that he continued on his tear through this past week, and made it that much easier for us to include him in our most recent installment. Funny how that works out. With eight points in his last seven games (well, eight points in five of his last seven games), Myers is finally starting to reap the benefits of that pre-season resolution to shoot the puck more. The offense is coming along nicely, but what’s probably the most apparent is how complete his game is looking of late. And this likely comes in part from him being paired with Philip Samuelsson, who is very sound on the defensive side and offers him a bit more support, and as such, space to work with. This is certainly part of it, but on his own, Myers is looking more and more settled as we move deeper into the season. More and more, things seem to be clicking for him, and he’s moving closer to looking like the dominant presence that we saw out of him last season. Yes, we know that we made Mark Friedman one of our stars last week, and yes it was deserved this week too. I mean, let’s be honest here, the Phantoms we not super good for a lot of this weekend, so we’re not really in a position to be too picky about who we’re selecting. Anyway, we’ve been talking a good bit about how Friedman’s quietly been stringing together a series of very sound performances, and now his offense is starting to come along more. He just tied his career high in goals, and he broke that high last weekend in pretty spectacular fashion. Leier: "Bro what did that water bottle ever do to you?" Friedman: "It looked at me funny." And, really, just about everything about this sequence suggests good things for Friedman, for the fact that he trusts his offensive instincts enough to dip low in the zone to make that play. That he has the shot to execute. And that Kerry Huffman has enough trust in his abilities to send him out in overtime in the first place. It’s all good stuff, and it’s just getting better. Another repeat! But hear us out, we have our reasons. His stats are still solid, as we saw in our leaderboard section, but we really want to praise him for the fact that he was one of the few players who looked to be working to actively contribute through the whole of the weekend, even when the rest of the team was struggling. Indeed, he was doing exactly what the team wasn’t and needed to be doing more of, as evidenced in his goal from Saturday. That is, he was getting himself to the front of the net and either creating chances on his own, or getting in position to pick up some rebounds and test the opposing goalie. As we said, this isn’t something we were seeing a lot of this past weekend, so to have Aube-Kubel doing it makes it stand out just that much more. That’s leading by example, or something like that. This section is just as much an update as it is an observation, it seems. We noted last week that we had some concern about the number of games Alex Lyon was playing, and found ourselves wondering how the goalies would be managed, heading into this stretch of a lot of games in not that many days. And, it seems, our worries that this would spiral into Lyon playing all of the games because Huffman doesn’t trust Komm were quelled, as the weekend saw them splitting the games, with Lyon starting on Friday and Sunday and Komm on Saturday. The additional good news is that Komm looked good enough in his first start. It may sound like a hard thing to say, given that they came out of that game in Hartford with a loss, but we can’t really hang all of that on Komm. The team in front was struggling to generate much, and the defensive lapses had him hung out to dry. The goals he gave up may have been stoppable, but they were difficult, coming off of shots and deflections in tight. We can’t begrudge him that, too much. That said, we can feel at least relatively comfortable with the goalie situation, going forward–Lyon’s the starter and playing some good hockey, but signs are pointing to him having a solid enough backup to give him some breaks, so that he’s not run into the ground until (if?) someone else is returned from the Flyers. And it seems the theme of this week’s observations is that of usage. As we said, we can say that the goalie usage was good. The forward lines, though? Perhaps a bit more questionable. There are pieces of this that we like, and that we understand. For example, putting Misha Vorobyev up on the top line (which was the proper top line)—as a player who’s needed to get his feet moving a bit more since he’s returned from injury, trial by fire-ing him, if you will, as if to say “here are all of the minutes and the toughest competition, sink or swim, kid” makes some sense (and worked, we should also note). And maybe you bump Aube-Kubel down to the second line to try and get them going. But giving Goulbourne some shifts up in the lineup, who we’ve seen struggle to close on the chances his linemates set up for him, is a curious choice. And maybe we’re nitpicking, because they did win on Sunday, and maybe the ends justifies the means, and all that. But we still come out of this with a strange feeling, because the change did get the results they were looking for, but it seemed that the problem in the earlier games were not of the lines lacking in chemistry, but in a flawed process that had them bleeding a lot of shots and failing to create much in the way of dangerous chances. And maybe that’s the piece that needs some shoring up (and hopefully has after a week or practice). It’s another three-in-three weekend, folks! Are we all exhausted already? At least we get to see some of this action at home, this week. The Phantoms kick things off tonight against Binghamton, who, just like when we saw them last, have been having a bit of a rough go this season, and are hanging out at sixth in the North division. Then we have a home-and-home Saturday and Sunday with Hershey, who are still hanging out at last in the Atlantic, and who the Phantoms dispatched of pretty neatly last time they met with a 6-1 victory. So, more of that please?